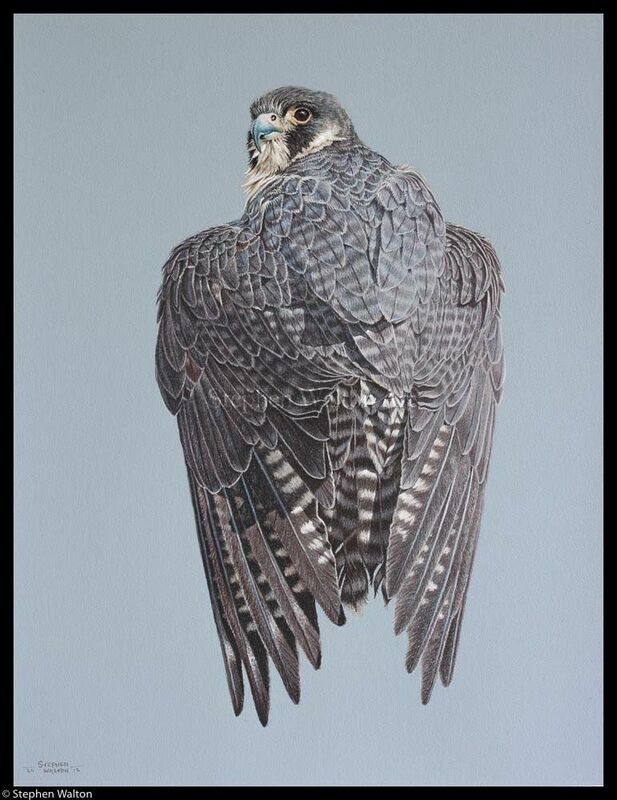 This Peregrine Falcon is one of just a few colour works I have done in the last few years. It turned into a major investment in time and effort and I really enjoyed building the feather structure. Rarely am I so pleased by a finished drawing. I simply have little artistic interest at the moment in including the animals environment unless i feel the picture absolutely needs it. I enjoy selecting and then drawing animals and birds isolated on a plain background. I strongly believe that the viewer is able to make the leap and mentally fill in information I intentionally leave. There are many superb artists who create pictures; animal, environment and all so I don't feel any pressure to do likewise. Few things in nature captivate like the stare of a bird of prey. I wanted the intensity of its look be reflected in the intense nature of the feather detail. I used pastel pencils to enable me to create this level of detail. An absolute favourite which I have hanging next to me as I draw.